Last week M and I met a German friend for lunch at a café near her office on Potsdamer Strasse. We decided to walk there; it didn’t look far on the map, and it would only have been one subway stop on the train. We stepped out into the cool air and made our way past the edge of what I had seen so far of our neighborhood. We walked down a street we had never followed before, and what caught my eye were the streetwalkers who had taken up positions in between the parked cars in calculated distances, one every four cars or so. They posed a serious threat to any cyclists on the street, as they stood between the parked cars and the passing cars, well positioned to hop into any passenger side door. Their necklines were plunging, the cleavage dramatic; the makeup thick and mask-like. It was disconcerting to walk their street at noon. We turned the corner and walked a few more blocks and noticed little things like old-fashioned wooden hat stands in one window, and a display of figs in another. Mostly I was looking at the street numbers to be sure we didn’t miss the spot where the restaurant would be. The restaurant turned out to be a storefront we could have walked past a hundred times and never have thought to duck in. The exterior is unremarkable but inside is a warm and inviting space that was once the residence of German writer Joseph Roth. We stepped inside, and sure enough, there was our friend Elke waiting for us. It’s a welcome sight to traipse across town into strange territory, open the door and see a smiling, familiar face waiting to see you, one kind face in a sea of strangers. We joined her at the table, and she walked us through the menu—all kinds of local specialties, most notably wiener schnitzel and spaetzle. She pointed out that this space was filled with memorabilia of the author, and I looked around and saw now that there were quotes from Roth’s books framed and hanging, copies of his books covering one wall, and photographs of the author dotting the space. I saw that it was a lovely room painted the color of old paper, and the checkered floor and dark wood all created the sense of being in someone’s private dining room, as if you yourself were there at the invitation of the author. Elke runs art-focused tours of Berlin for locals and foreigners, and she is always ready to point something out that you might otherwise have missed. In her strong accent she transforms the simplest outing—let’s meet for lunch—into a chance to show you a slice of Berlin you never would have seen otherwise. After we ate and settled our bill, she led us back the way we had come for several blocks. But this time I wasn’t scanning the street for streetwalkers or building numbers. She led us to a hatmaker’s and we stopped before the first window, where an entire white room was dedicated to men’s hats. And the closer you looked, the more you realized that you were looking at the most beautiful men’s hats you could imagine. 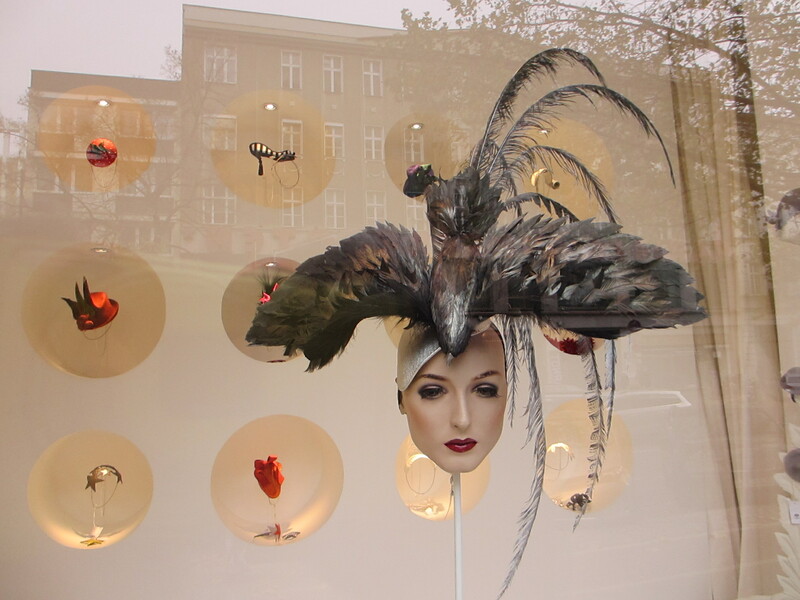 Next came a window opening into the women’s hats, and a magnificent bird seemed to emerge from the most dramatic hat of all, surrounded by smaller bird hats that again were nothing if not art. She took us to the third picture window where we stood on the sidewalk and peered in to see two women conferring over a piece of teal felt bent around a wooden head. The table before them was covered in bits of feathers and fabric. The room was white with wooden shelves behind them filled with more tools of their peculiar trade—making fabulous hats for some customer base entirely unknown to me. Elke pointed out the sign above us: Fiona Bennett. She is often featured in Vogue, she told us. People come from Japan just to visit her store. Her creations are worn in operas and on stage all around town. We walked a little further, and here was an alleyway that M and I had scuttled past on our way to lunch without even a glance. Elke led us through this entryway and we stepped into a cobblestone courtyard. The noise of the street behind us faded. Here were apartment buildings facing the quiet courtyard on one side. On the other was the old location of the printing house of Der Tagesspiegel, a local newspaper. The delivery bays had recently been converted to artists’ studios. She led us in one doorway that opened into a warehouse-sized space filled with housewares and clothes. The prices were untouchable, but we weren’t there to shop. Without Elke, M and I surely would have turned and fled, unwilling to look at men’s suits and women’s dresses that were designed by someone with great taste, knowing that we would never buy anything in that store. Yet with Elke, we felt allowed, enabled, to walk through and simply admire all that we saw. We left and went into the next door, and here was an art installation of three tents erected in the large white room. 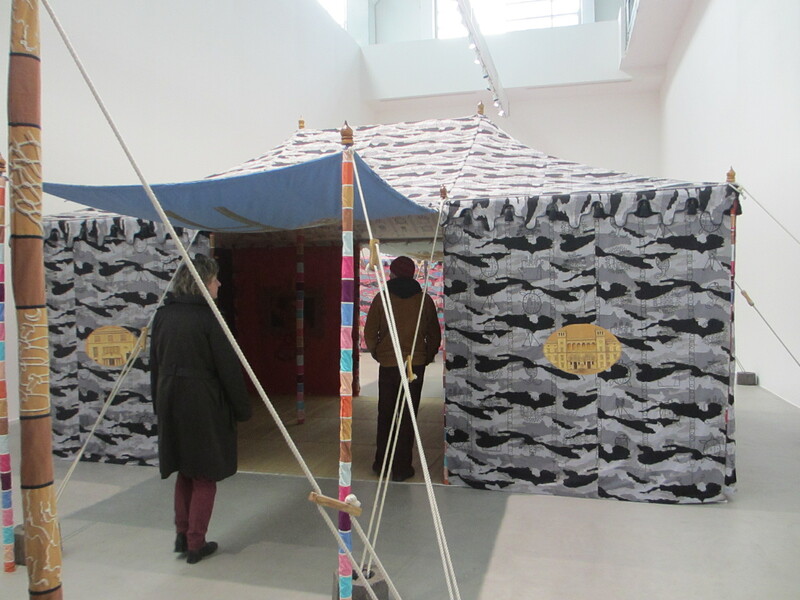 Each tent was hand-sewn and both sides of the canvas were painted with human and animal images. We walked through each tent and no guard was there to see us, no admission was charged. It was an art gallery and though it was not obvious to me what might be for sale—a tent?—we walked through and enjoyed the sensation of being transported to some otherworldly place. The next doorway held a painter’s showroom, where three young men sat at laptops near the front door and all but ignored us as we entered and took in the wall of moody paintings created by one man. As we left we passed a small private viewing room where a collector or serious buyer would be shown individual works he or she might be considering to purchase. The clerks did not look up as we left. Elke led us back to the busy street and into a Turkish grocery store where we could not resist buying dried figs and a tray of desserts like baklava and other honey-nut-phyllo dough concoctions to share with the girls. We crossed the street and soon Elke led us into another entryway I never would have noticed, and suddenly we were in a garden with a fountain still running in spite of the cold, and sloping grass and manicured bushes. We passed through another entryway that removed us even further from the sounds of the city, and here we felt as if we were miles from civilization even though we had only taken fifty steps from the main boulevard. Quiet studios opened onto this space, and occasional bursts of children’s voices from an unseen school echoed through the area. A group of printmakers worked in white aprons behind large windows facing the courtyard. It was another place entirely. One more block and we reached Elke’s office building. But first she led us into her own courtyard, and she pointed out the green tiles on the buildings that were smooth to the touch and added an old-fashioned pattern to the sides of the buildings among the white brick. Yet another detail I easily could have missed. We took the elevator up two floors, then walked through the floor below hers, past hundreds, maybe thousands of bolts of fabric, the offerings of an establishment that had been there since the 1930s filled with material that had surely been turned into the curtains and bed-covers and children’s clothes for generations of Berlin families. The neighborhood is changing and rents are rising, Elke told us, and this shop will be moving out soon. M and I were grateful just to have seen it, though it’s hard to say exactly why. This impromptu tour can be found in no guidebooks. It requires the careful eye and curious mind of one who knows what to look for and is willing to say it, point it out for you, help you observe what is right before your eyes. It kills me to admit that all of this was invisible to me without our guide. Without her I saw only prostitutes and the grey drizzle of a dark city. With her help I saw that there is art and beauty all around us. What a world of difference it makes to have a guide. If each person we meet would simply walk us through their neighborhood and point out the little things they love, we will see Berlin. We have not yet gone to Museum Island and seen the treasures the city has to offer. We’ve delayed these treats until the dark winter months, when friends will come to visit. I treasure this tour of Potsdamer Strasse as much as my row past Glienecke Brucke and Anke’s words illuminating the history all around us, where without her I saw only unsteady water and mansions along the shore. I am reminded yet again that I must look past the obvious to see what else is here. And I must allow myself to linger more often, to go ahead and stop in front of a shop window and wonder, what is that bird doing on that woman’s head? Who has taken so much time, love and care to create such a magical thing? And placed it here for all to see? This entry was posted in City life, History and culture and tagged Berlin, Der Tagesspiegel, Fiona Bennett, Potsdamer Strasse on November 11, 2013 by Jill M.. Thanks so much, Kristen! It makes me happy to be able to share these thoughts with you and others — anyone interested enough to read. I appreciate your note and look forward to seeing you when we’re back. 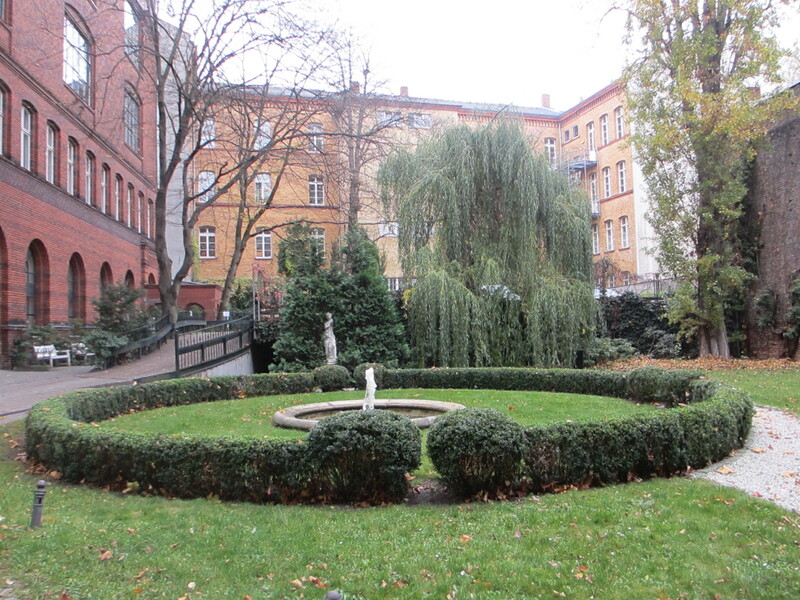 I love sharing your peek into this tucked away but humming all around you part of Berlin. I love that so much of it is textile-based! The “secret garden” nature of things like this always makes them feel more special to me, like being in on a marvelous secret that is only secret because no one else noticed it. Thanks, Merie. I am happy to share these places with you — I know you’d love them too. One thing I didn’t mention in my post was a sign we saw about the history of a group of women over a century ago who formed their own drawing classes with professors when they were not allowed to attend the universities. The sign is on the street as if it were a street sign, but it’s a history marker about education denied, and the ways those left in the margins still found a way to learn. Made me think of you, Madame Professor. Wow, thank you, Joan! I’m glad to hear you liked it. I want to see the hat store…I love hats so much. If you like hats, you’d love this place. I have a picture of the men’s hats that I’ll share with you.